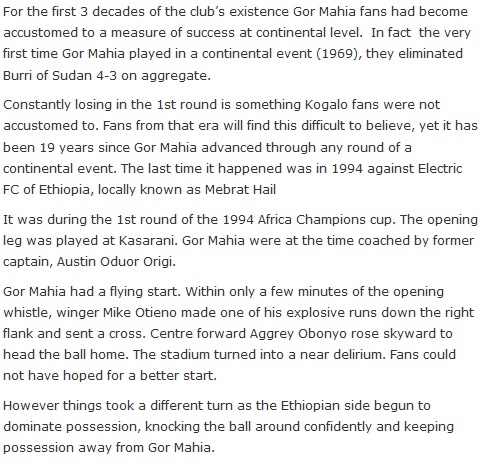 Kogalo has the will, stamina and the ability to do proud for the fans, club and the Nation Kenya as a whole. It has done it before!! All we need to continue doing is continue giving it sincere support and goodwill. Very soon it will land in the promised land CANNON! correction: promised land of CANNAN. Pliz take note. Sorry!! Read in conjunction with comment # 1 hereabove. Erokamano jokogalo. if you play for or support Gor, then one should get and feel the spirits of the mighty Kogallo, this is a legion, it is a calling. For Gor we die on the pitch and terraces. we are more than fanatics, ask Bobby Ogolla, ask Apingu Nyawawa, this is a great following, we offer nothing but sweat and blood cause we are unequavocal for Gor. please think of nothing else but victory, Africa here we come, clear the way as GOR BIRO YAWNE. tom okaya, tom ochieng, mike otieno and others….yes we used to get up to quarterfinals and occassionally finals for continental cups ! Those days nobody knew about TP MAZEMBE. The reason why we are where we are is because of poor leadership. Indeed its been a long time. How I wish k’ogalo would reach far in this campain .I realy love this club and am just waiting to see how we start this campain. And there we will be. “If wishes were horses even beggars would ride”. Do not set unrealistic targets. This team is still at infantry stage in the continental competition. Let us grow with team and stop banking on past glory that are meant to jog your mind back to the historical era. @ Albert Kosero “Sofaset Branch” Ja- Kampala used caution me that “Rome was not built in a day”. And some of us are setting their demand beyond the expectation. You will suffer from ULCERS for nothing. Learn how to CRAWL , the Practice how to STAND-STILL before you can dream on how to WALK and lastly RUN. Nyakogalo I agree with you. But Kogalo demands the kind of players who are used to playing under pressure. If a player cannot deal with such pressure thene he can forget any ambitions of playing overseas because fans overseas will have no patience. ogango trailer, the first day you step into class or workplace, you aim to be the best, if at the end results come otherwise, you encourage yourself and move on, on sarto we will win, that is the spirit in sirkal, otherwise pessimism will take us nowhere. who thought Nigeria could take CAN from day one? a Kogalo loyal always a Kogalo loyal, be positive and let the rest be for post match analysis. even the best ensambled team at times loses matches remember galactico. Those who always talk of 1987 team, be reminded that that was then and we r in 2013 and these boys r equaly good. You dont expect the 1987 squad to rejoin Gor and come to conqure Africa.The fact that kenya did win against Libya shows how strong our league has grown and we should not underrate our teams. I believe that we shall make a statement as K’ogalo in africa this year. just watch this space. The History of 1987 was for a reason. It was to inspire any club in this country not to look at themselves as inferior. It should therefore add more adrenalin to our players to work extra hard to achieve even past the 1987. Please use the Karate experiment “to hit an object you do not aim the object but aim beyond it and the impact will be great” Our current team cannot be the History but they can make their own history. we are cheering them on.